CATHY RIGBY’S PETER PAN | Love Productions Inc.
With an eternal youth that still defies gravity, Olympic gymnast Cathy Rigby was nominated for a Tony and won an Emmy playing the most famous “Peter Pan” of the last 30 years. More cocky, boyish “Peter” than “Pan,” her performance delights audiences with children of all ages, and more than a few audience members walk away with “fairy dust” on their mind, and a renewed flight of their own fantastic youth. Acrobatic flight, fairies, gigantic crocodiles and magic are common here, and lost boys and Indian braves fight pirates with puckish charm, bows and arrows, and Spanish rapiers. An updated version of the Jerome Robbins Broadway original of J.M. Barrie’s tale, this experience will have your whole family chuckling, gasping, and humming a tune or two on the way home from the theater. 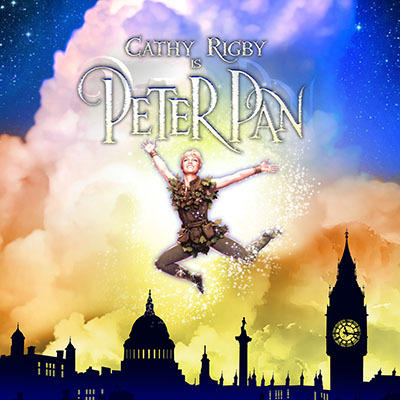 “Just believe” in Cathy Rigby’s Peter Pan and you might never grow up too…at least for two hours in Neverland.